BOONE, Iowa--(BUSINESS WIRE)--Today, The Climate Corporation, a subsidiary of Monsanto Company (NYSE: MON), announced at Farm Progress Show the addition of new features to its Climate FieldView™ digital agriculture platform that will help farmers manage variability in their fields and analyze seed performance to uncover valuable insights. For the 2017 season, Climate is introducing tools that help farmers optimize their inputs and instantly visualize and analyze crop performance to make the best decisions for their fields. The company is also expanding seamless data connectivity to help farmers get all of their data in one place and making the Climate Fieldview platform available to more farmers across the United States. Yield Analysis Tools - The Climate FieldView platform is introducing new seed performance analysis tools to help farmers evaluate the impact their agronomic decisions have on yield, so they can build the best plan to maximize profitability for the next season. Farmers can analyze seed performance by soil type, field, or management zones and better understand their field variability by quickly and easily comparing digital field maps side-by-side. Advanced Scripting - This season, farmers will be able to choose between simple manual seed prescription tools or advanced prescription tools to help optimize their return on their seed investment. The Climate FieldView platform’s advanced scripting uses the farmer’s historical field data, combined with data from proprietary field-testing results, to provide seed prescription options that farmers can easily customize and execute on their equipment of choice. Zone-Based Nitrogen Management - In 2017, the Climate FieldView platform is enhancing its nitrogen monitoring tools. 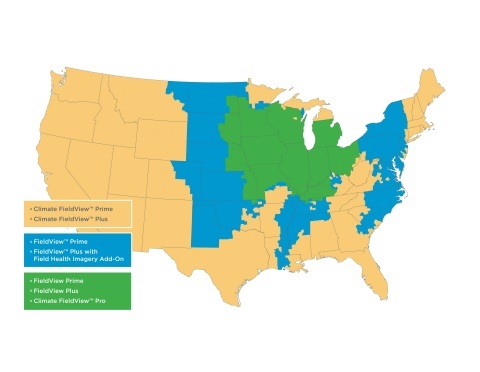 This season, farmers will be able to monitor nitrogen by customizable zones in each field to help them better understand their unique field variability and take action to prevent yield loss. Data Connectivity - The Climate FieldView platform is the most broadly connected digital ag platform in the industry and is further enhancing its equipment connectivity by expanding the reach of the Climate FieldView™ Drive, a device that easily streams field data directly into the Climate FieldView platform. This season, FieldView Drive will work with most tractors and more than 50 percent of combines in the United States and is currently in beta testing for use in air seeders and application equipment. The company also continues to build on data import capabilities with other agricultural systems, as well as manual file upload. Climate FieldView also is the only third-party digital ag platform with near-real time data connectivity with John Deere equipment through its Wireless Data Server (WDS). The WDS technology is now standard on John Deere’s 2016 S Series combines, and starting with the 2016 harvest, seamless connection between the WDS and the Climate FieldView platform is enabled. The WDS is factory installed on 2016 S Series planters and combines, and most 2012 or later flagship equipment models are compatible using a retrofit kit. Expanded Geography - More farmers across the U.S. will have access to field health imagery through Climate FieldView Plus™ this coming season, with availability on 165 million acres of corn and soybeans, 41 million acres more than this past season. Additionally, field health imagery will be available for all major row crops in 2017. For the 2017 season, Climate FieldView™ Plus provides seamless data collection, storage and visualization; field health imagery, manual seeding prescription tools and the new yield analysis tools for $749. Climate FieldView™ Pro includes all of the features available in FieldView Plus, with the addition of nitrogen monitoring and advanced seeding prescription tools. FieldView Pro is available beginning at $1,499, based on farm size. Both FieldView Plus and FieldView Pro will be offered as 365-day subscriptions to give farmers a full year of product value regardless of purchase date. The company is currently offering special pricing to encourage farmers to experience the value of FieldView Plus firsthand. Farmers who purchase FieldView Plus by Oct. 15, 2016 receive an extended subscription at 2016 pricing through Dec. 31, 2017. Climate FieldView™ Prime, which provides field-level weather, notifications and scouting tools for timely decision making, is free and available across most crop-growing regions in the United States. In 2016, the Climate FieldView platform was on 92 million acres, and the premium offerings were on more than 14 million acres. For more information about the Climate FieldView™ platform, contact your local Climate dealer or visit climate.com. The Climate Corporation, a subsidiary of Monsanto Company, aims to help all the world's farmers sustainably increase their productivity through the use of digital tools. The integrated Climate FieldView™ digital agriculture platform provides farmers with a comprehensive, connected suite of digital tools. Bringing together seamless field data collection, advanced agronomic modeling and local weather monitoring into simple mobile and web software solutions, Climate FieldView™ Prime, Climate FieldView™ Plus and Climate FieldView™ Pro give farmers a deeper understanding of their fields so they can make more informed operating decisions to optimize yields, maximize efficiency and reduce risk. For more information, please visit www.climate.com or follow the company on Twitter @climatecorp. Monsanto is committed to bringing a broad range of solutions to help nourish our growing world. We produce seeds for fruits, vegetables and key crops – such as corn, soybeans, and cotton – that help farmers have better harvests while using water and other important resources more efficiently. We work to find sustainable solutions for soil health, help farmers use data to improve farming practices and conserve natural resources, and provide crop protection products to minimize damage from pests and disease. Through programs and partnerships, we collaborate with farmers, researchers, nonprofit organizations, universities and others to help tackle some of the world's biggest challenges. To learn more about Monsanto, our commitments and our more than 20,000 dedicated employees, please visit: discover.monsanto.com and monsanto.com. Follow our business on Twitter® at twitter.com/MonsantoCo, on the company blog, Beyond the Rows® at monsantoblog.com or subscribe to our News Release RSS Feed.